THE CHALLENGE | WE GO! Violence against women is widespread in Europe and the scaling up of intimate partner violence (IPV) is alarming. According to the European Agency for Fundamental Rights, almost one in four women (22%) experience physical and/or sexual violence in a relationship with a man. Its causes are often interrelated with poverty, economic dependency and gender discrimination. The lack of economic independence is one of the main challenges women face when they try to leave their abusive partner. Anti-violence centers across Europe recognize that women often remain in violent relationships because of their financial dependence on the violent partner. This issue is coupled with the fact that women are considerably under-represented in the labour market and in management roles, with the overall female employment rate still being lower than that of men. In this background, between 2015 and 2017, the European Union funded the WE GO! 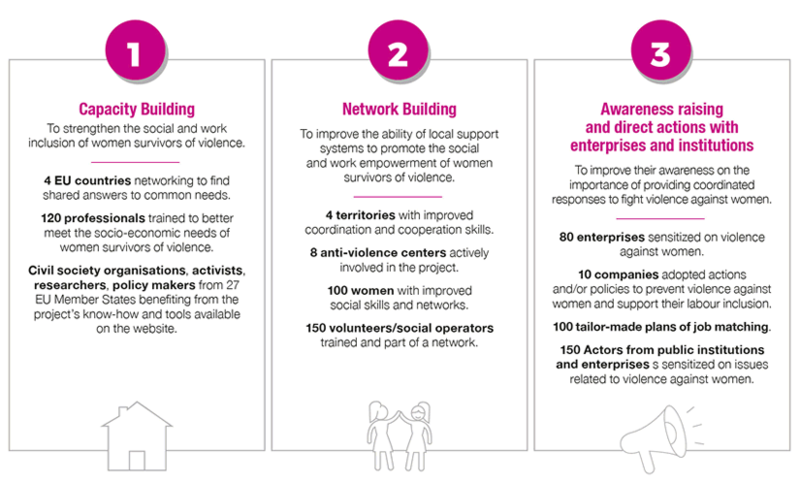 project with the goal to strengthen the support services for women suffering from IPV and to foster their social and economic empowerment through the enhancement of the know-how and working methodologies of both anti-violence centers operators and other relevant actors. The second edition of WE GO! has started in December 2018 and it aims to support the economic empowerment of women who survived intimate partner violence by strengthening the local and national support systems, exchanging European good practices and establishing cooperation networks between private and public stakeholders. La Fundació Surt desarrolla regularmente itinerarios de empoderamiento económico para mujeres en situación de violencia machista en la pareja. Women that Count is online! Women that Count is an Opendata platform that provides data and information produced in the framework of WE GO!, a two-year project involving 15 organisations in 7 European countries. Marisa Soleto, director of Fundación Mujeres, reflects on the importance of the project WE GO! and the need for a greater political commitment in order to repair the damage done to survivors of gender violence. This website has been produced with the financial support of the Rights, Equality and Citizenship (REC) Programme of the European Union. The contents of this website are the sole responsibility of ActionAid International Italia Onlus and the project partners and can in no way be taken to reflect the views of the European Commission.